any idea on the name of the pattern??? Thread: any idea on the name of the pattern??? My MDG was the one who inspired me to sew, craft and eventually quilt. Attached is a picture of a quilt sent to me by one of my schoolmates. She thought MDG had given it to her. Based on the stitching and finishing, I am positive she did. 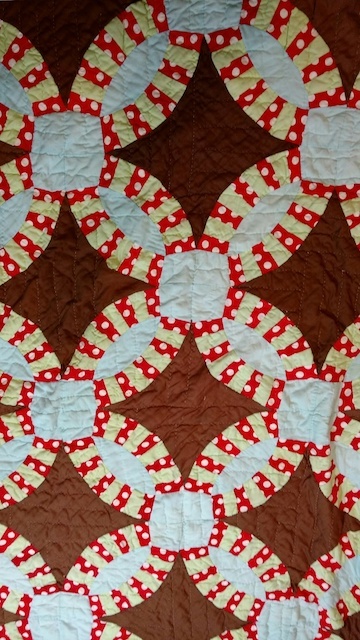 She made "covers" not quilts for most of her life. 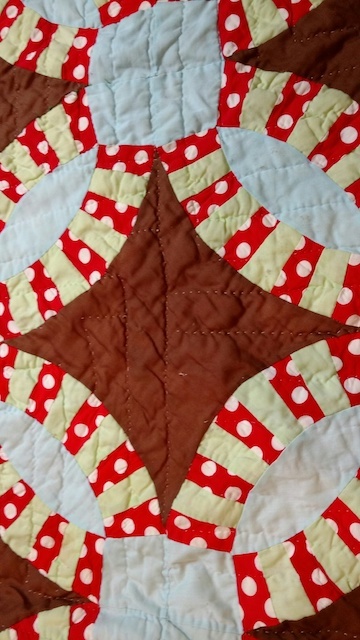 The only pieced parts are the green/red & white dot arch, the area where a blue piece joins another and finally the piecing to the brown inner part. I don't know what the pattern is. The batting is OLD cotton batt and when held up to light there are areas of empty space. A lot of missing stitches and the like, rust, other stains and seems to be thin fabric for the backing- very pale pink. Is this similar to a wedding ring? except with rectangles instead of squares in the red dot and green???? Thanks Tiggersmom! Here is one I found after seeing your post and is similar in the arch part. yes it has to be a wedding ring. 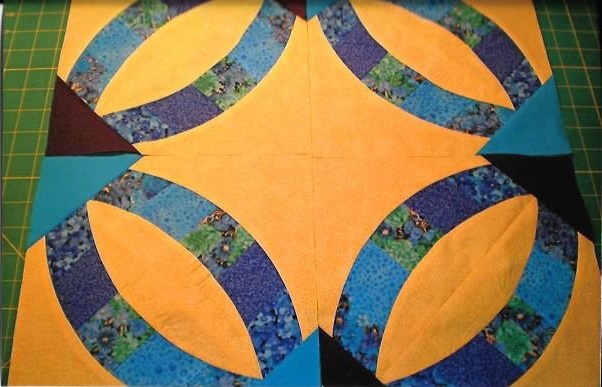 i started one, still haven't finished and it called for triangles on the ends of the pieced arcs. they form a diamond when put together like the light blue in your photo. Nativetexan, that is beautiful fabric! Hope you will finish it, great color choices. After much thought on this quilt and seeing the condition, I decided to take it apart and try repairing the top. As it turns out, the already thin fabric was so worn in some areas that I decided to cut a 30" square to get a full ring. Even that came apart but I did get it on the design wall. Hoping it will inspire me to make a DWR in honor of my grandmother. I took lots of pics before I cut so I can include those in my quilt history book. Can you at least frame a piece of that old quilt? It is sooooo pretty. Sad, I found a DWR quilt top in my stash of stuff, this last couple weeks, Don't know where it came from! It is all hand stitched blocks, very old fabric, the blocks are not put together so that it lays flat... I have no idea how to rescue it, someone put lots of work into it, but I think it will be a total loss... wanted to post a picture of it but the camera on my laptop is doing something crazy!